Photo by Flickr user Kishore Bhargava. The tranquil perch has been open since June. If you haven’t been, I highly recommend you find your way on a Saturday to Noble Coyote Coffee Roasters’ new coffee lab, a soothing, only semi-discovered, tranquil perch open since June—one of the newest coffee spots in town and possibly the one with the least press. Until now, the husband-and-wife team of Kevin and Marta Sprague has operated primarily wholesale. 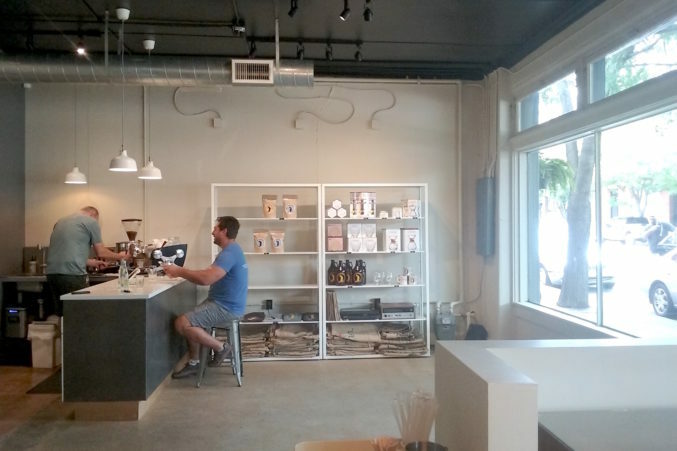 You could find their whole-bean coffee at a number of local shops and have it brewed at a slew of coffee shops such as downtown’s Serj and Oak Cliff’s Local Press & Brew. This is their first own bona fide coffee shop, per se. For several years after they went into the coffee business, they roasted in a warehouse space off Garland Rd. near White Rock Lake. A year and a half ago, they moved to their current location in Expo Park, but the site was purely a roastery. Now, they’ve added the shop front and coffee lab. The new space is light and lovely, with big windows that look out onto Exposition Blvd. and are framed by foliage. Hours are Tuesday-Saturday 10am-2pm. It’s a spare operation and their focus is still squarely on roasting. 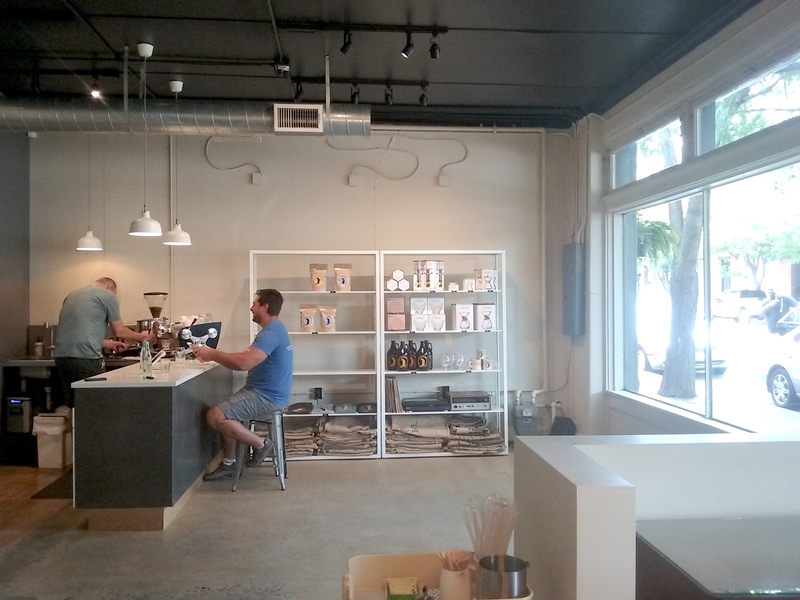 The coffee lab, in fact, is in part designed as a place for potential wholesale customers to come in, try various blends, and also see how they pull on the Slayer espresso machine. It’s also allowing the Spragues to amass a modest neighborhood crowd that is now beginning to include regulars. The district is quiet, with the Ochre House Theater, a scattering of art galleries, and Eight Bells Alehouse attracting mostly a night flow. A portable chalkboard outside has encouraged people to beat the heat with a cold-brew iced latte. Few people simply amble by; this is part of why the perch feels so tranquil. In the back, when Marta opens a burlap sack of green, unroasted beans the aroma is intensely floral—almost more like a delicate apricot white tea than a coffee. From the start, they’ve been committed to sustainable growing and direct trade. Recently, they’ve been having fun discovering new coffees, like the natural-process Ethiopian that’s so strikingly complex in aroma, or a Panama that has a wild undercurrent of blueberry. (If you ask Marta, it becomes all baked goods, all blueberry muffin, when you fashion it into a milky drink like a latte or cortado.) I’ve really been loving a beautifully balanced, smooth and bright Guatemalan. Part of what’s fun, in fact, about the coffee lab is that it does feel, especially in these early days, like a lab—a place of discovery. Don’t come here expecting scones and biscotti and a full toast program. They’re dealing in coffee. Period. And in the absence of a formal menu, you’ll find yourself being asked what you like and going from there. One or the other of them still makes a get-away to run a stand every weekend at the White Rock Late farmers market, where they got their start in 2011. Meanwhile, it’s nice to be able to have their coffee at the source; to soak in the space and talk with Kevin and Marta. It’s also another coup for this developing stretch of Expo Park.